Author of one book, manager of two wineries, mother of three children, and speaker of four languages, this fourth generation vintner and physician has mastered the juggling act. 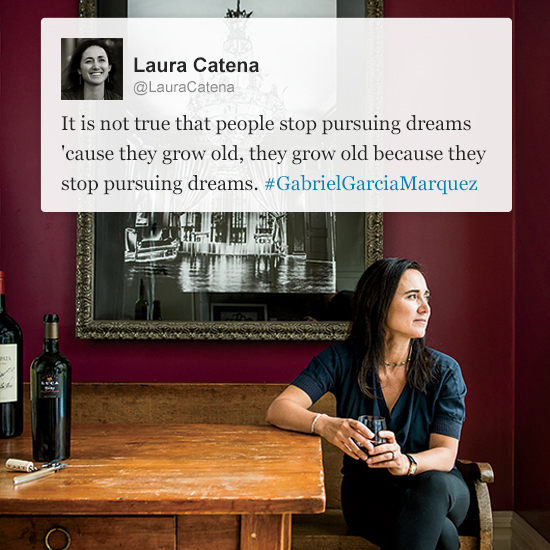 She has been an integral part of the Argentine Malbec movement and promoter of the Mendoza wine region where both her family’s winery, Bodega Catena Zapata, and her own, Luca Winery, are located. After getting an MBA at Columbia and working in the corporate world, Christy Frank decided to do something unusual: open the smallest wine shop in Manhattan. In just 300 square feet in Tribeca, Frank offers an amazingly well-curated selection of wines from Australia to South Africa, France, Italy and beyond. 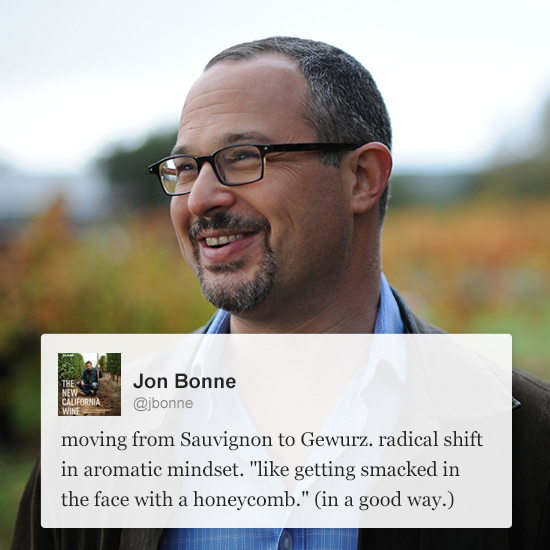 The provocative owner and winemaker at Bonny Doon Vineyards covers topics that range from his nontraditional grape-growing methods to why he's in favor of ingredient labels for wine. 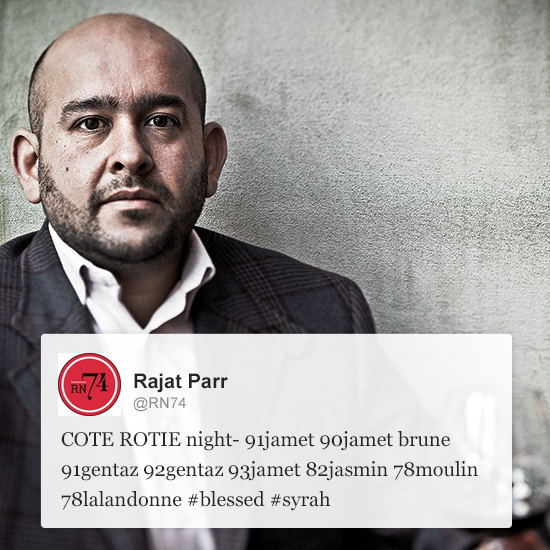 Raj Parr, the head of wines at Michael Mina's restaurants and RN74 in San Francisco, eats and drinks so well that he has a personal rule: no grand cru and no Cornas for lunch. Those big-ticket bottlings have to wait for dinner. The peripatetic sommelier frequently tweets selfies as he personally depletes the world's stock of fine wine. 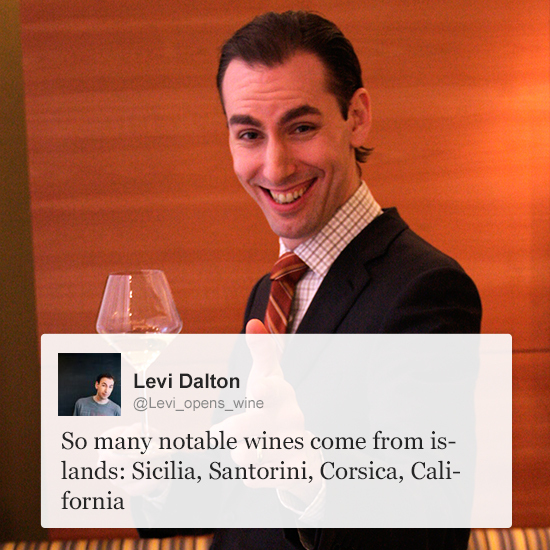 The head sommelier at Rouge Tomate in New York loves natural wines. She's also a champion of Chenin Blanc from her native Loire Valley. 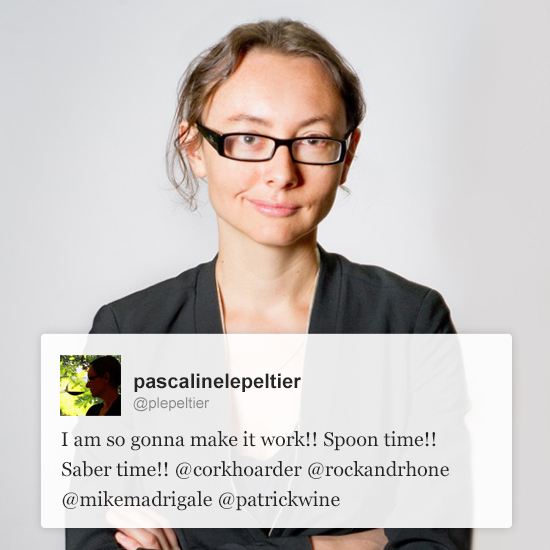 Via her Twitter feed, you might get a chance to watch her saber Champagne with a spoon. 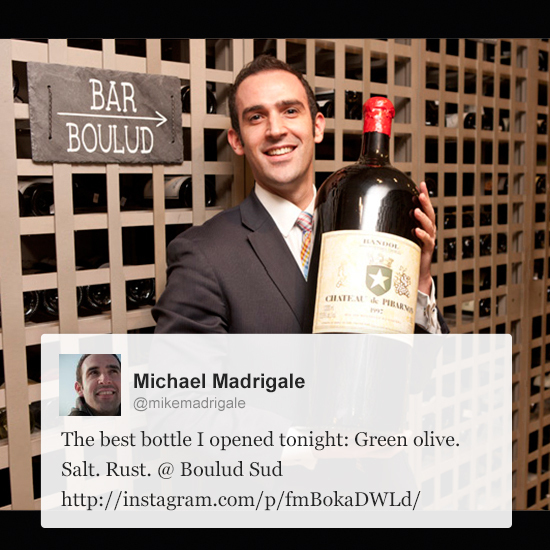 Frequently after service, the head somm at several of Daniel Boulud's New York restaurant tweets about his top bottle of the night, describing the wine with three descriptors and a photo. On Instagram, his feed is filled with photos that juxtapose New York street style with the magnums of amazing wines he serves. The indefatigable London-based wine writer tweets links to a variety of useful wine stories, not all her own. 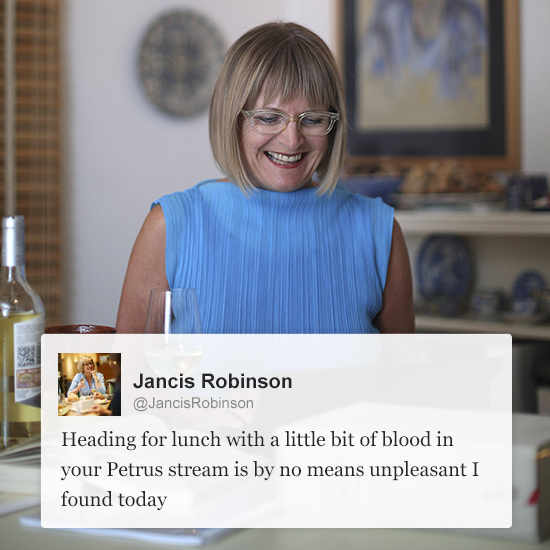 She writes the wine column for the Financial Times, was the editor of the Oxford Companion to Wine, and most recently showed her enthusiasm for offbeat grapes as the lead author of Wine Grapes, profiling 1,368 varieties. 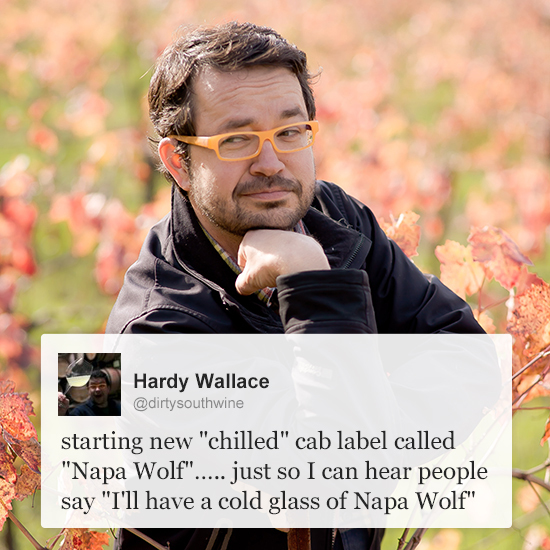 Wallace won a social media video contest that brought him to Sonoma, where he became obsessed with wine. He stayed, worked for various wineries, got married, and now is making his own low-alcohol Mourvèdre and skin-fermented Sémillon under the Dirty and Rowdy label. 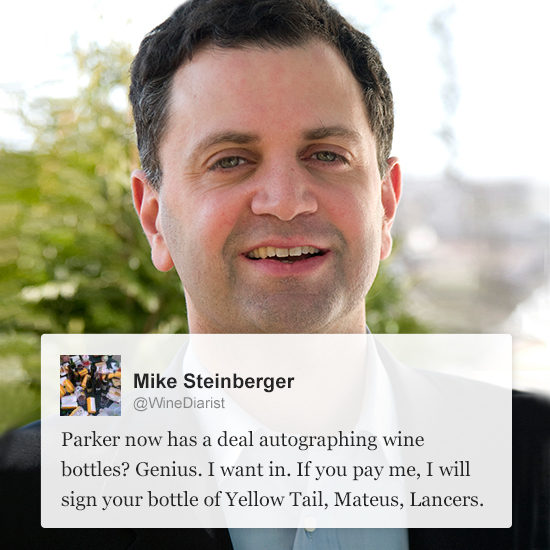 The former wine columnist for Slate deals in serious zingers. He's covered all of the recent wine counterfeiting stories, so you can find out how to check the condition of your '47 Cheval Blanc magnums. Baiocchi is the editor in chief of the super-fun new site Punch and the editor of a forthcoming book about sherry. 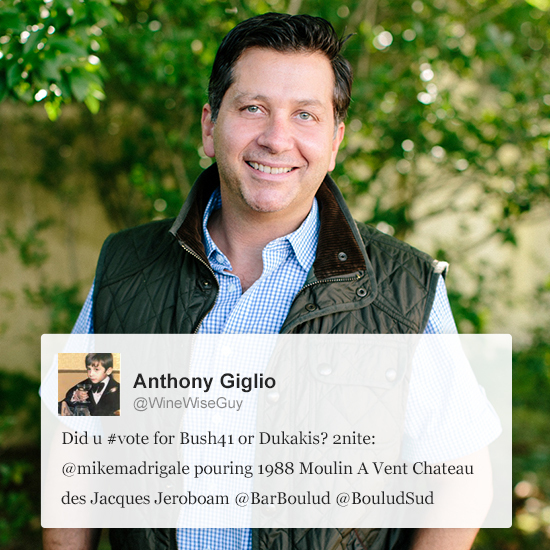 The New York Times columnist is one of the most universally-respected wine authorities online. 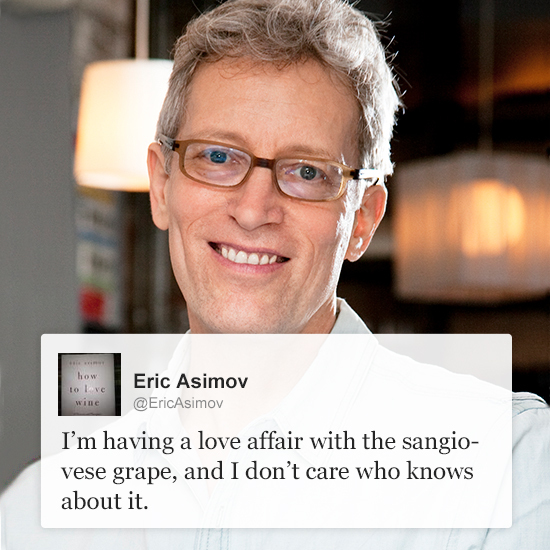 His links frequently point to required reading for any wine lover. 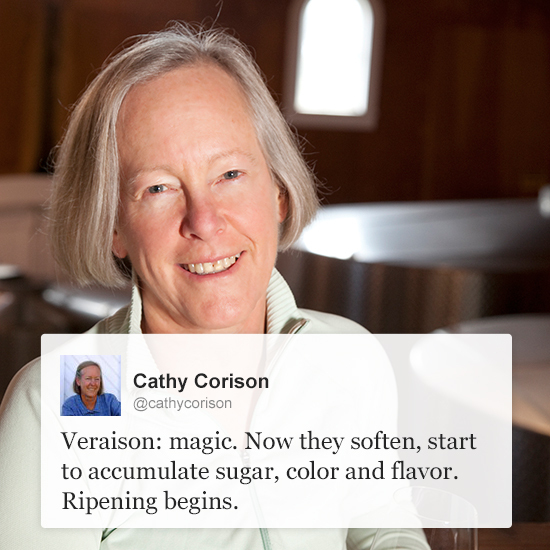 Surrounded by her Cabernet Sauvignon vines, Cathy Corison tweets from the edge of St. Helena in Napa. Her refreshingly elegant and restrained style of winemaking draws on 26 years of making Cabernet Sauvignon. 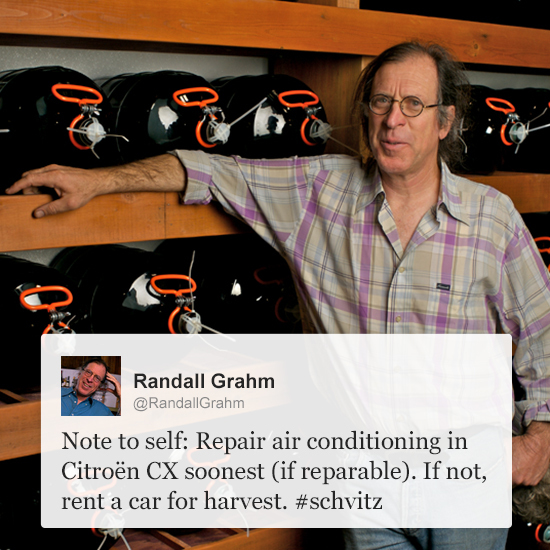 On Twitter, she talks about harvest, how her wines are aging and passes out the occasional promo code for the winery. 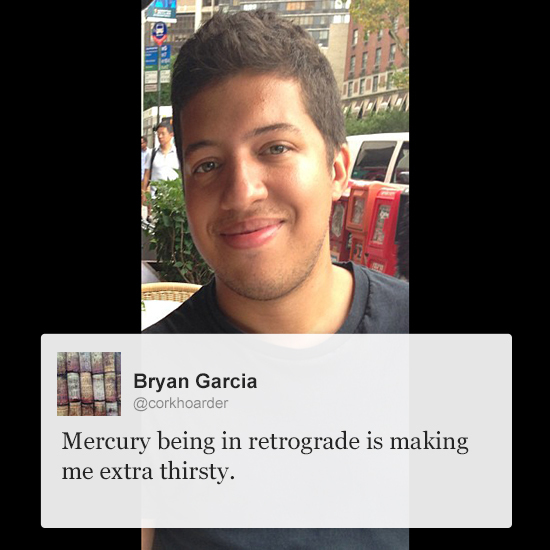 After a stint working at Gary Vaynerchuk's social media company, Bryan Garcia tweeted his way to friendships in the wine world through discussions about hard-to-find wines such as Raveneau, Selosse and Overnoy. Garcia now works for Grand Cru Selections, an importer. 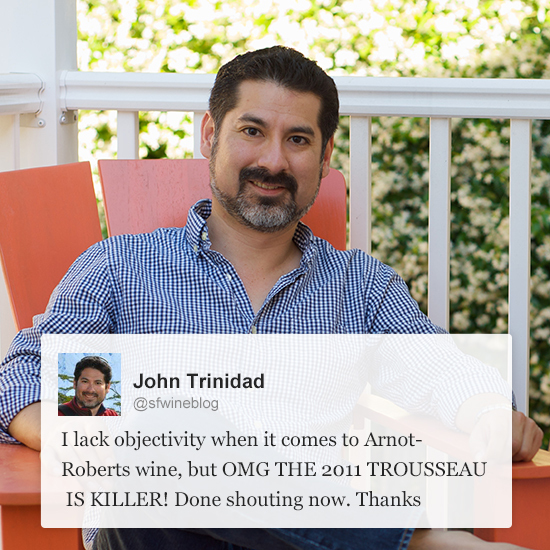 Napa-based wine industry lawyer John Trinidad doesn't consider himself a wine expert, and he proudly states that on his site, SF Wine Blog. But he is an enthusiast to such an extent that he's visited Burgundy, the Loire, the Jura and the Mosel Valley, and worked harvests in Sonoma and Burgundy. He also takes terrific photos. 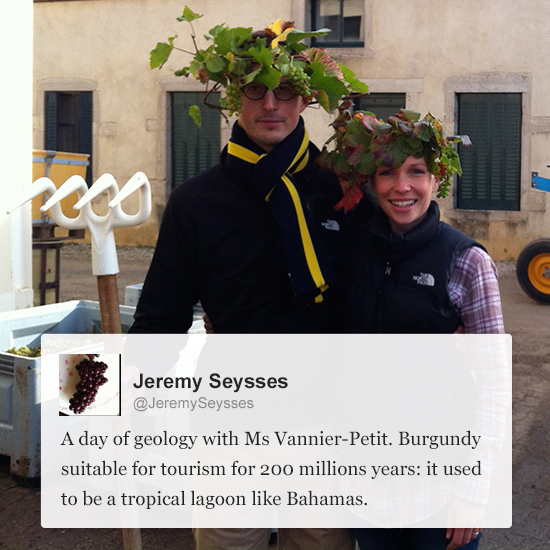 The owner and winemaker at Burgundy's esteemed Domaine Dujac, Seysses is a font of information about the region. As wine editor at the San Francisco Chronicle, Bonné tastes through much of what California has to offer. His tweets help you to stay current on the Golden State, which still makes about nine out of every 10 bottles of wine produced domestically. 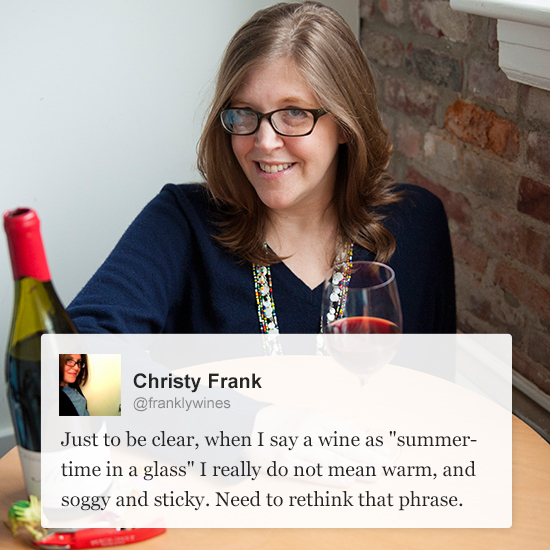 Eater NY's wine editor hosts a podcast called "I'll Drink to That." He engages key people in the wine world—from importers to journalists to sommeliers—in wide-ranging talks. The indefatigable wine educator, writer and drinker tweets a fantastic stream of bottle-spottings from some of the country's best wine events.